Mr. Bacon was nice enough to gift me with an ice cream maker for my birthday. Immediately I started scouring Pinterest for ice cream recipes to test out. When I found this cheesecake version from Add a Pinch I knew I had found the perfect recipe for my new machine’s maiden voyage. The result is probably my favourite recipe all year. This stuff is frozen gold. Enjoy! In a large saucepan on medium high heat, combine the cream, milk sugar and cream cheese. Use a whisk to stir the mixture continuously until the sugar has dissolved and the cream cheese has combined with the cream and milk. Remove from the heat and add the vanilla and salt. Chill in an airtight container overnight. 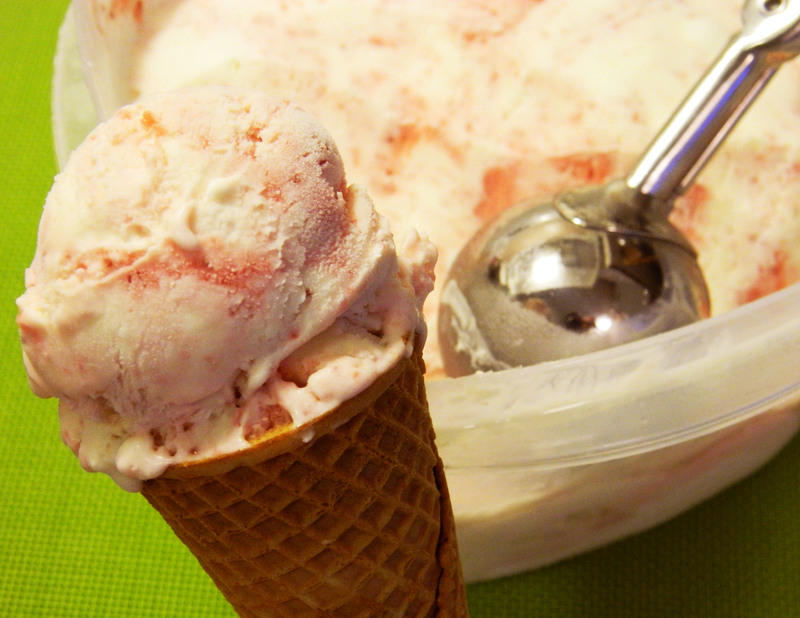 The next day, add the mixture to your ice cream maker and follow the manufacturer’s instructions to make the ice cream. Remove the batch from the machine while the ice cream is still the consistency of soft serve. Scoop it back into your airtight container and before placing it into freezer to fully harden, gently fold in 1 cup of strawberry sauce. Don’t overmix or you won’t get the swirl effect.